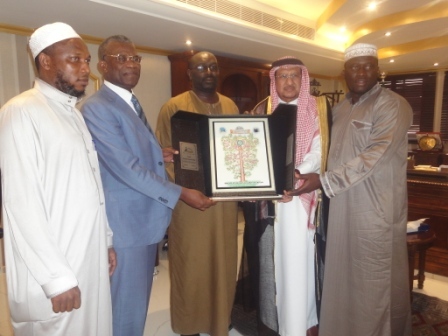 Presenting the gift in the holy city of Mecca on behalf of his Government, Major General Ahmed Sembawa, who is also the Chairman of the Hajj General Cars Syndicate, commended President Koroma for his relentless support to the Muslim Community in Sierra Leone, especially his active involvement in the welfare of his people making pilgrimage to the holy land. 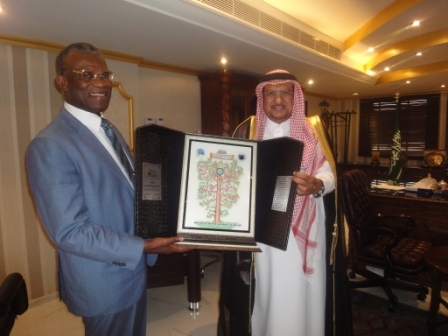 Accepting the gift on behalf of the President, Sierra Leone’s Ambassador to the Kingdom of Saudi Arabia, Alhaji Mohamed Sillah Kargbo thanked the Custodian of the two Holy Mosques, King Abdullah Bin Abdulaziz Al Saud and his Government for the remarkable, meaningful and memorable gift to the President of the Republic of Sierra Leone. He described the gift as a true expression of the considerable respect that the Saudi King harbours in his bosom for President Koroma vis-à-vis his style of governance and the great concern he has manifested as regards the welfare of Sierra Leone Muslims in general and Sierra Leone pilgrims in particular since he was elected as President of the Republic in 2007. Kargbo further stated that President Koroma has always emphasized the need for religious tolerance because, it brings Sierra Leoneans together and it shows that they are all one as a nation. He pointed out that religious tolerance is the country’s culture based on the inter-religious marriages taking place in the country. The envoy showered his unreserved praise on the Saudi King and his entire Government for the excellent facilities and arrangements always put in place for use by pilgrims across the world. He pointed out that pilgrims have performed the Hajj rituals with ease and comfort over the years due to the excellent services and facilities provided to them by the Saudi Government. President Koroma’s envoy also commended the Saudi Government for the effective security measures it puts in place annually to ensure the safety of all pilgrims. His Excellency went further to describe King Abdullah as a towering figure in the Muslim world; a leader who has been championing the cause of Islam at every event and occasion that requires the Islamic Ummah to defend the Islamic faith and portray the true Islamic image to the outside world. He furthered that the Saudi Monarch has been leading a pioneering and pivotal role when and where the need arises to relieve people from calamities and natural disasters befalling not only Muslims but also non- Muslims around the world. These humane stances of King Abdullah, the Ambassador said, indicate the profound humanity and purity of heart the King is tremendously endowed with. Kargbo said despite his short tenure in Saudi Arabia as the Sierra Leone envoy so far, he has witnessed the giant construction projects and the significant educational programs being launched in every region of the Kingdom. He stated that these developmental strides are all indicative of how profoundly the King is concerned about the general welfare of his people. He also depicted King Abdullah as a true embodiment of true Islamic spirit and genuine and responsible leadership that should be emulated by leaders of the world. Concluding, the Ambassador prayed for the continued prosperity and security of Saudi Arabia and assured the Saudi Pilgrimage authorities that the gift will be appreciated not only by His Excellency, Dr. Ernest Bai Koroma, but also by Sierra Leoneans as a nation because it is symbolic of the value and strength of the cordial diplomatic and bilateral relations existing between Sierra Leone and the Kingdom of Saudi Arabia. It would be recalled that since he assumed power in 2007, President Koroma has never relented in giving support to the Muslim pilgrimage (Hajj), which is one of the five pillars of Islam. Born to a cultured and dedicated Christian family in the Northern city of Makeni in the Bombali District, President Ernest Bai Koroma was raised in a Christian home with Wesleyan background. But what has left most Sierra Leoneans bewildered is the President’s vested interest in the Muslim Community. Ironically, some of President Koroma’s predecessors, (with due respect to them) who are Muslims never put much premium on Hajj. Prior to 2007, there was a proliferation of fly-by-night organizations that received money from Sierra Leonean Muslims for the Hajj and many of these organizations would end up disappointing them. Between 2003 and 2006, for example, hundreds of Sierra Leoneans who had paid some agencies for the pilgrimage were abandoned at the Lungi International Airport, Gbessia International Airport in neigbouring Guinea – Conakry and Nnamdi Azikiwe International Airport in Abuja. Those were some of the embarrassments and challenges intending pilgrims had to grapple with before the President Koroma assumed office. Some of our former leaders never had interest in protecting the welfare of pilgrims as no action was taken against the agencies that allegedly duped or failed to render services to the intending pilgrims whose money they had received with the pretext that they would take care of their trip to Mecca, accommodation, feeding and other facilities that hinged on their daily welfare. It even came to a time when Sierra Leoneans jokingly called such victims of circumstances as ‘Alhaji Abuja’, ‘Alhaji Lungi’, ‘Haja Conakry’, the list went on and on. But today, the multiple agencies that used to handle the Hajj programme have submerged into oblivion while President Koroma and his Government have taken ownership of the Hajj programme, which has been going on smoothly for the past few years. Under his regime, Sierra Leone pilgrims no longer have to worry about airline, accommodation, medical, feeding, and other issues pertaining to their welfare because of the proactive approach of President Koroma’s Government to put all modalities in place for the pilgrimage way ahead of time. This clearly demonstrates President Koroma’s religious tolerance and accommodation of all Sierra Leoneans irrespective of religion.